A Sociedade Bíblica Ibero-Americana do Brasil e a Abba Press lançam a Bíblia King James Atualizada – Edição de Estudo – em comemoração aos 400 anos da primeira publicação autorizada das Sagradas Escrituras pelo rei da Inglaterra em maio de 1611. 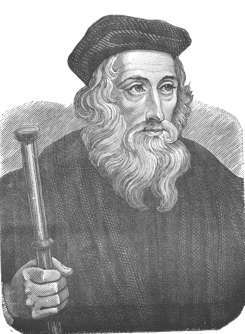 Called “the morning star of the Reformation,” John Wycliffe caused a stir by preaching against the abuses and heresies of the Roman Catholic “church.” He and his followers (called “Lollards”) pointed people to the word of God, not the Roman Catholic hierarchy. In the 1380s, Wycliffe published the entire Bible in English. The Roman Catholic “church” burned his Bibles and his books. Approximately forty-four years after his death, in an act of contempt, the Roman Catholic “church” dug up his bones and burned them. 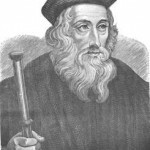 They did not stop with Wycliffe, they also persecuted his followers like Bohemian priest John Huss who they delivered to the “secular authorities” to be burned at the stake. Translated the holy scriptures as an outlaw on the run. 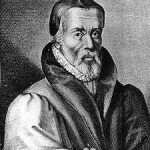 It is said that Tyndale was once told by a clergyman, “We had better be without God’s laws than the Pope’s.” To this, Tyndale responded: “I defy the Pope, and all his laws; and if God spares my life, ere many years, I will cause the boy that driveth the plow to know more of the Scriptures than thou dost.” Tyndale’s translation of the New Testament was published in 1525. Roman Catholic Cardinal Thomas Wolsey demanded his arrest as an heretic. 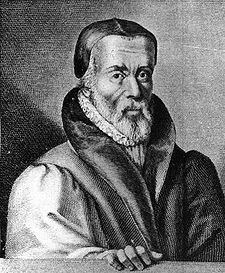 Tyndale was eventually burned at the stake in 1536 during the reign of Henry VIII. The first king of Great Britain, King James I specially commanded the translation of the Authorized Version of 1611 of the holy Bible, identified the pope as antichrist, and through his writings (such as his “A Premonition to All Most Mightie Monarches, Kings, Free Princes, and States of Christendome” found in his Workes, pages 287-338) he was the principal force in discovering to European rulers the injuries that they had long sustained by the usurping tendencies of the Roman Catholic papacy (the Roman Catholic institution has long been involved in the political arena, and still is). His defense of the Divine Right of Kings was simply a defense of kings being able to run their own kingdoms without papal (or Jesuitical) interference. Roman Catholics (including Jesuits Owldcorne and Garnet) tried to kill King James during the infamous Gunpowder Plot of 1605. James’ “Remonstrance for the Right of Kings” (Workes, pp. 381-484), explores the meddling of popes in government affairs and the devastating results of Roman Catholic recusancy. 1380-82 Wycliffe’s New Testament and Old Testament published in 1380 and 1382 respectively. 1408 Roman Catholic synod in Oxford, England made it illegal to read the Bible in English without permission of a bishop; the “Constitutions of Oxford” of 1408 noted that translation of Scripture into English is a crime punishable by charges of heresy. 1428 Wycliffe’s bones exhumed and burned by order of Pope Martin V.
1455 Gutenberg Bible published – The world’s first book printed on a mechanical movable type printing press. 1516 Textus Receptus, the “Received Text”, was published. Background: Erasmus (1) examined various Greek manuscripts of the Bible found in the finest libraries in Europe, (2) selected renderings received by the church throughout the ages, and (3) compiled his edition of the Greek New Testament which later became known as the Textus Receptus. 1525 William Tyndale’s New Testament published. 1540 Short document for the Jesuit order approved (detailed constitution for the society would come later). The following year, Ignatius de Loyola elected as their general superior (Encyclopedia Americana © 1971, “JESUITS” entry). [For further information...search for "Counter Reformation"; "At one time or another the order has been expelled from EVERY country in Europe...", etc.] 1547 Edward VI, a Protestant (and son of Henry VIII), becomes king of England. At eleven years old, he wrote, A Small Treatise Against the Primacy of the Pope. 1555 Queen Mary I (also known as Bloody Mary), a Roman Catholic, bans Protestant translations of the Bible. About 300 men, women, and children are burned to death during her short reign over England, including John Rogers and Thomas Cranmer. 1559 Pope Paul IV added Erasmus’ works to Rome’s index of prohibited books (Index Librorum Prohibitorum). 1588 Spanish Armada devastated in Spain’s attempt to overthrow Protestant Queen Elizabeth I and make England Roman Catholic. In England, a commemorative medal of the victory was struck with the words, “God blew and they were scattered” inscribed on it–God was magnified for sending the fierce storms that had destroyed much of the fleet of the mighty Spanish Armada. 1603 King James’ godmother and cousin, Queen Elizabeth I, dies. 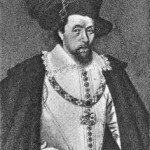 James crowned King James I of England. 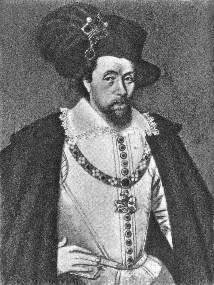 He is now King James VI (Scotland) & I (England). 1604 At the Hampton Court Conference, King James agrees that a new translation of the scriptures is in order. In that same year, translators selected. 1605 During the Gunpowder Plot, Roman Catholics–including Jesuits–try to blow up King James and the British Parliament. By miraculous divine intervention, the King discerned the plot (see, A Discourse of the Maner of the Discoverie of the Powder Treason, Joyned With the Examination of Some of the Prisoners,” in The Workes, pp. 223-246). 1607 Colonists arrive in Jamestowne, Virginia. Jamestowne (James’ namesake) will go on to become the first permanent English settlement on the American mainland thereby making King James VI & I founding monarch of the United States. 1611 Authorized Version published in May of 1611 by the Church of England. 1649 In January of 1649 King James’ son, King Charles I, is executed by order of Puritan Oliver Cromwell and other insurgents after their hostile and short-lived takeover of the British government. Eikon Basilike, or, The King’s Book, was written by Charles I during his captivity at Carisbrook Castle in 1648 and published posthumously. It reveals the king’s thoughts and Christian testimony during his imprisonment and impending death.